The Bijou Dress is an absolute classic LBD from Forever Unique party dresses UK. We keep coming back to this designer as the quality and cut is just right for a short party dress. Rent the luxe party dress from GMD and team it with heels then you’re ready for your event! 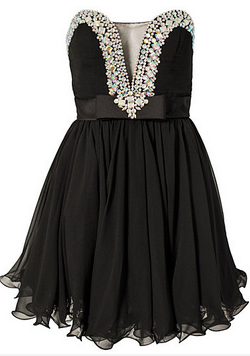 The bow on the front with crystals, decorates and compliments this dress perfectly. Fun and flirty, it can be a prom dress but would also look great as an evening cocktail dress during happy hour or a fancy dinner. Very versatile and full of possibilities. Such a cute look from such a fab designer! We love the name Bijou, as it really represents the jewel aspects of the dress and the intricate detail that adds such a fab sparkle to the designer little black dress. Posted November 21st, 2013 in Designer Close-Up, Dress of the Week, Uncategorized. Tagged: ball dress, Ball dresses, Ball gowns, Celebrity Dresses, Cocktail dress, cocktail dresses, Designer dress, designer dress hire, Designer dresses, Dress Hire, dress of the week, Dresses, Evening Dresses, forever unique, forever unique dresses, Girl Meets Dress, hire celebrity dresses, hire cocktail dresses, Hire dresses, party dresses, Prom dress, rent celebrity dresses, Rent designer dresses, rent dresses, short dresses.